Sue R from http://www.etsy.com/shop/SueRunyonDesigns made this gorgeous snowflake necklace. Perfect for winter or those of you in warmer climes who wish winter would be here. 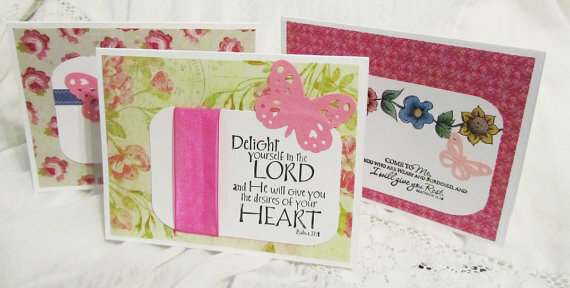 Beautiful scripture notecards, handmade by Christi of luvncrafts. Jen has made this very clever ring from an old watch and a beautiful blue jewel. Don't worry about measuring your finger, this one is adjustable so it is bound to fit! And finally, from ThoughtfulGemsCraft comes this little sack to pop your soap in, perfect if it keeps getting lost in the bath. There are plenty more beautiful handmade items available from the CASTteam, just put "castteam" in the Etsy search bar while you are shopping and you will find goodies from Christian shop owners around the world. Great choices. Maybe I'll put together a castteam promo blog post too! That looks great! Thanks for including my wedding candle. I love the diversity of talents on the team. Of course the friendship and support is simply the best. These are all beautiful-great gift ideas. I don't know what a street team is either! Love all of the showcased items. Our CAST team is a talented lot! We are such a gifted team!